With the upcoming rise in technology, homeowners are entering a new era where they no longer need to worry about the security and safety of the valuables and the loved ones. To make the homes more secure, manufacturers are bringing more and more monitoring technologies that are just more than a typical CCTV system. Smart Locks, Sensors, and much more devices are present in the market that will give you the assurance of full security of house and the people residing there. SpotCam belongs to the category of home monitoring cameras and is the world’s first cloud based PAN technology enabled camera. Forget all the hassles of installing all those wires along with the old cameras; SpotCam is the most advanced and smart monitoring camera that saves all your footage on the Cloud. So, today we are going to review this advent device with smart control technology that provides an eye over all the important places like home, office or workplace right from your smartphone, Tablet or PC. With Free Cloud Recording, Night Mode and WiFi enabled technologies; SpotCam HD Eva is the latest personal surveillance camera that can be used and set up at any place where you want. It comes with the inbuilt mic and a speaker so that people can hear and communicate on the remote basis as well. With the advanced connectivity features, SpotCam allows you to monitor all the premises by watching the videos right on your mobile devices or laptop. So, whether you’re on the vacation or traveling, you can still watch the video recordings and surveillance footage whenever you’re connected to the internet. 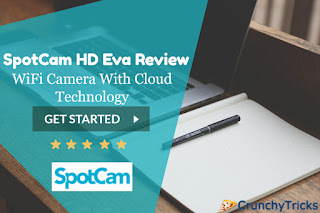 What is SpotCam HD Eva? The SpotCam HD Eva is the latest WiFi enabled monitoring camera from the company and is dedicated to protecting all of your valuables, home and the loved ones residing there. The Cloud-Based home webcam is capable of recording videos that can be viewed directly on your Mobile, Laptop or PC. With 360-degree rotation and weatherproof hardware, SpotCam HD Eva is the best option for indoor monitoring purposes. 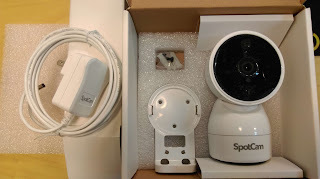 Keeping Connectivity and Real-Time Monitoring on the top, SpotCam has garnered the device with the latest Cloud Camera Technology which makes it the world’s first Cloud-based Pan based home monitoring system. Now forget about all the long cables and installation problems of the typical P2P system, with free cloud storage feature and live video surveillance, SpotCam HD Eva makes enables you to keep an eye on all the premises even if you are traveling or on a vacation. The device comes with a wall mounting kit, cable, and a power adapter. Setting up the devices is the easiest and fun task to do. The Camera is modern, portable and records HD videos. With features like Night Vision and Cloud Recording, SpotCam is ideal choice as most of the thefts and burglaries happen in the night. You can setup the camera with any of your devices. For example, you can monitor all the recordings with your iPad, just download the App and link your home network with the camera. Within a matter of seconds, you can start monitoring your home from where you want. SpotCam provides free Cloud Save option which can store the video footage of 24 hrs. Premium plans are also available which I’ll discuss later in the review. Infrared LED’s & Night Vision: – Thanks to the 18 High powered IR LEDs, Eva HD has the capability to record HD videos even in the dark. Real-Time Alerts: – With MySpotCam App, you will instantly get alerts regarding any presence in the house via SMS or email. WiFi Connectivity & Monitoring: – The device can be easily connected over WiFi with your mobile and other devices. So, you can control and monitor all the recordings on the go. Social & Sharing: – SpotCam allows you share your footage with other people as well. Not only this but with the Eva HD you can also make videos from the recorded footage. Two Way Communication: – With the inbuilt microphone and speaker, you can easily communicate with the other people right through SpotCam. Tilting Angles & Range: – The camera is designed such that a person can monitor and change the viewing angle 50 degrees up and 20 degrees down. What I Loved the Most about SpotCam Eva? 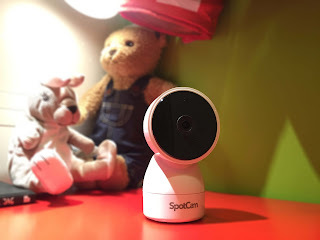 The best feature about the SpotCam Eva is the two-way communicating system that enables the owner to interact directly with the people inside the home or office through the SpotCam Eva’s inbuilt Mic & Speaker. Using this fantastic feature, the person can take the direct action if something unusual is happening inside the premises. The biggest problem with a typical cumbersome CCTV system is that it requires a lot of time for setup and costs too much for maintenance. SpotCam is just the solution for all these problems. The camera is very easy to setup and can use from any device over WiFi, and this fantastic piece of tech is available at the price of $199 in the United States and €199 in Europe. All in All, SpotCam HD Eva is the ultra-modern blend of surveillance technology and is making your home safer and secure. You can quickly setup the device and is very easy to operate. So, this was the review of the SpotCam HD Eva cloud-based monitoring device. It is a definite recommendation for all. It is worth considering if you’re looking to setup a monitoring camera in your home or office. With so many smart features and free cloud storage options, SpotCam is the best deal for anyone who is planning to secure his house more with smart tech and security enhancement.